The Jabra UC Voice 150 Duo is a cost-effective binaural (both ears) headset featuring Jabra’s well-known high standards for quality regarding both visual design and sound quality.The headset certified and optimised with all leading Unified Communications platforms and is fully functional with the latest generation of softphones. Simply connect the headset to the computer and it is ready for use. The intuitive call-control unit attached to the cord allows for fast user adoption. 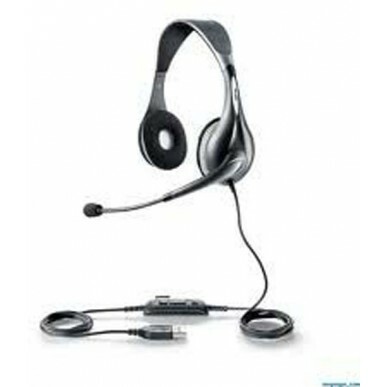 The headset features superior sound clarity for softphone calls, conference calls, live presentations and other multimedia applications. The microphone includes a noise-reduction feature, ensuring that the recipient cannot hear background noise from the speaker’s surroundings. This makes the headset suitable for use in louder office environments. Optimized with all leading Unified Communications platforms (see MS version for Lync or MOC.